It is powerfull music, that makes you want to march. Nowadays you can watch them relaxedly sitting in their own concert hall, and you will often see them in ceremonies all over the country. In the mehter band the instruments were the big drum (küvrük kös), drum (tomruk davul), cymbal (ceng zil) and a horn. The name of the band was originally (8th century) Tug, then Tabilhane and Nevbet, and in the end mehter. From the Enc. Britt. on Yanissary: Yeniçeri (New Soldier, or Troop), member of an elite corps in the standing army of the Ottoman Empire from the late 14th century to 1826. Highly respected for their military prowess in the 15th and 16th centuries, the Janissaries became a powerful political force within the Ottoman state. 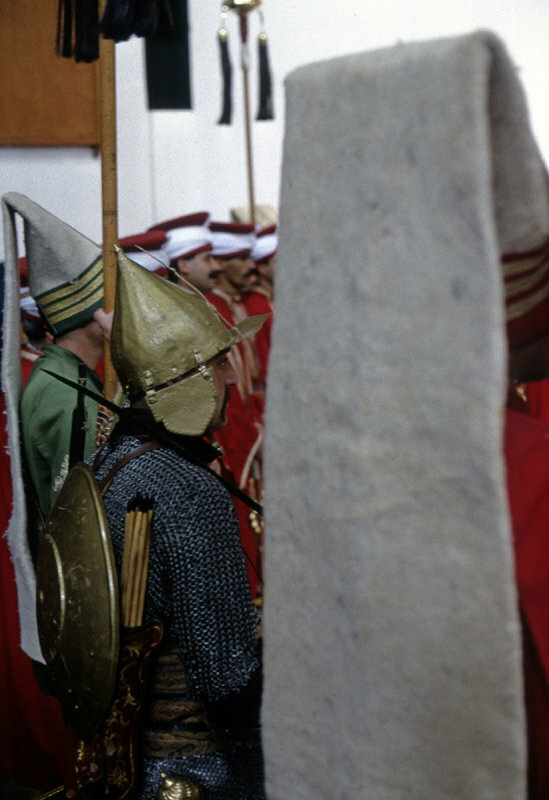 The Janissary corps was originally staffed by Christian youths from the Balkan provinces who were converted to Islām on being drafted into the Ottoman service. Subject to strict rules, including celibacy, they were organized into three unequal divisions (cemaat, bölükhalkı, segban) and commanded by an ağā. In the late 16th century the celibacy rule and other restrictions were relaxed, and by the early 18th century the original method of recruitment was abandoned. The Janissaries frequently engineered palace coups in the 17th and 18th centuries, and in the early 19th century they resisted the adoption of European reforms by the army. Their end came in June 1826 in the so-called Auspicious Incident. On learning of the formation of new, westernized troops, the Janissaries revolted. Sultan Mahmud II declared war on the rebels and, on their refusal to surrender, had cannon fire directed on their barracks. Most of the Janissaries were killed, and those who were taken prisoner were executed.